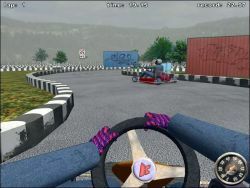 GeneRally is one of those racing games that goes outside the boundaries. 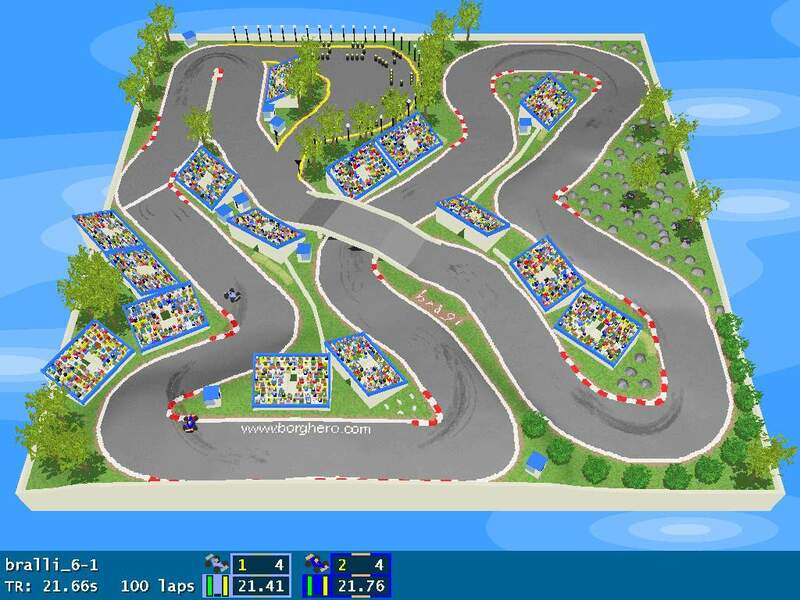 GeneRally is a racing game reminiscent of Super Sprint. GeneRally is so much fun. It is surprisingly very realistic for an arcade style racer with its realistic damage and physics, skid marks, and the fact that you have to take a pit stop for fuel and damage. It also has some pretty cool vehicles like a monster truck, a motor tricycle, and an indy car. GeneRally's tracks are very interesting and at the same time very challenging. Even when you are not racing, GeneRally can still be very entertaining. I personally like to get the monster truck and ramp onto the audience seats and run everybody over and surprisingly, it leaves blood trails behind your vehicle. There is also a track editor which is really in-depth and allows you to make some very interesting tracks, but you can have just as much fun playing the game as making tracks. Bottom line is: GeneRally is by far on of the most enjoyable racing games I have ever played, Freeware or Commercial, and is a sure win for anybody who likes racing games but you don't have to be a racing fan in order to enjoy this game, its just enjoyable. Period. GeneRally is very worth the download and is surprisingly a short download for all the game that you get. GeneRally is so good, I only stopped to write this review! The camera angle is fixed at 35 degrees and spanned to see the entire track, (which isnt too big) so it may take just a little getting use to. You can change your car too: from a monster truck for my figure-8 track to a drag racer! You also must make pit stops for damage and fuel! 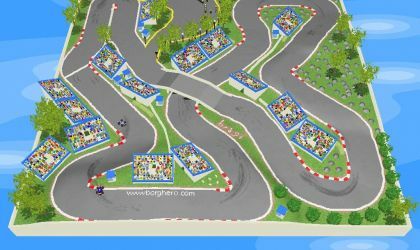 Many cars, many tracks (you can make your own!) many, many, many hours is what your going to put into this game. I can't say enough about the simulation part of this game. Body damage repair, refueling, skid marks staying through the entire race, etc. Gene Rally is a must for racers, sim fans and just about anyone else on the planet who is looking for a game! The game is so small as well! It's worth everyones' time - just try it and you'll see what I mean! I normally don't like racing games, but this one absolutely blew me away. I can't explain why it's so fun, but it just is. It's like remote control racing, but way better! Even though playing it is fun, I like making tracks even more! The track editor is simple to use, and within 3 minutes I had a playable track. Also, the website has so many more tracks, there's no way to play them all (See other reviews for website address). If you want good, replayable racing, and a fun game to play with friends, definitely get this one. It fits just over 1 megabyte (amazingly!) and I never tire (no pun intended) of it. Gene Rally is one of the great well-made 3D freeware games. 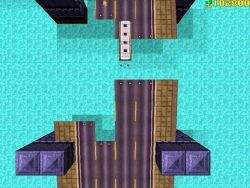 It is a racing game, very similar to micro machines. The graphics are simply beautiful and the gameplay is equally awe-inspiring. It is hugely detailed: skid marks are left on the road, pit stops are necessary and the list goes on. Another great thing about Gene Rally is that AI has been put in meaning you don’t have to bother a friend of yours every time you feel like a game. A great game, well worth the download. BEST GAME EVER! YOU HAVE TO DOWNLOAD IT! TRUST ME. You can make your own tracks from scratch or race from the 20 odd provided. You can even get 5 of your friends around and all 6 of you can race at once off one keyboard so no taking turns. Trust me this is one of the best games ever, and it's free. Download it and you'll know what I'm talking about! This game is the answer to lots of friends and only one computer. Great engine, great levels, great in it's simplicity. Level editor is just the ICING on the cake. Extremely easy, and fun. This game is fun - plain and simple. It takes some time to tweak the settings to fit your level of ability (no joke) but once you do, you get better and you bump up the challenge. Visit the generally website for updates! They have tons of new cars and tracks there! The address is in the readme file.